Conservation goes beyond the simple restoration of a piece of art. Conservation includes examination, documentation, treatment and preventive conservation (ensuring that the restored art work is maintained in the ideal environment). It is based upon extensive research and art conservators have extensive education in art methods, art history, and the scientific foundations of conservation. The primary goal of the art conservator is to preserve the cultural heritage of the art work by keeping the art as close to its original condition as possible. 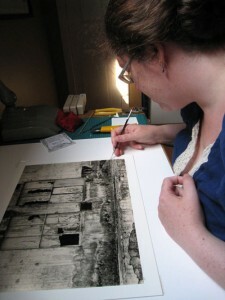 In order to accomplish this the art conservator tries to minimize what they do to the object, they try to restore the object in a manner that permits return to the original condition (in case better conservation methods are discovered), and they provide complete and accurate documentation of all action taken in the restoration and conservation of the object of art. These basic principles are so fundamental to the art conservator that they are included in national and international ethics guidelines, such as those adopted by the American Institute for Conservation Code of Ethics and Guidelines.